I highly recommend A&A Adventures. Our guide and driver - Ly Cheat and Shiva Teng - were first rate. We were in Siem Reap for 3 nights from 26th to 29th of November 2012. From the first moment the service of Angkor & Asia Adventures was great. We had Lucky as driver and Ratanak as our guide. Ratanak is much experienced and he knows the right time for every spot. Thank you very much for the warm welcome, for treating us a family on visit and giving us this wonderful trip. To Mr. Tim, our friend who showed us around and give us a glimpse of history and culture of their beautiful country. After much research we used Angkor & Asia Adventures for the 2 days touring the temples. This included the Apsara Dinner Show on the first evening. We dealt with Chhatra Chhim the Operations Director who successfully organised our tour even accommodating a late date change at our request. 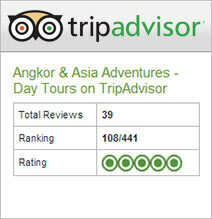 I chose Angkor & Asia Adventures primarily due to their flexibility to cater to my requets and their reasonable price.